Here is an article – like so many – from a journalist who stumbled upon a Laughter Club in Mumbai, India. Read in this particular one the testimonial of participant Mr Sadarangani, 78, who suffered from a brain stroke last year and was bed ridden for weeks but laughter helped him get back on his feet. “Doctors had cited an extremely slow recovery for me after the stroke. Daily sessions of laughter yoga have resulted in eighty percent recovery which the medics have endorsed to be very speedy,” he exclaimed. 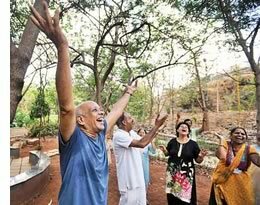 Another man, Gopal Ganguli, 68, had a frozen shoulder which had left him debilitated for years, but vanished in a few weeks, after he began twirling his hands vigorously before exhaling deep breaths while laughing at yoga sessions. This entry was posted in Laughter News and tagged brain stroke, laughter yoga, yoga sessions on May 13, 2013 by Sebastien Gendry. The 2010 All America Laughter Yoga Conference took place in Albuquerque, New Mexico, in August 2010. 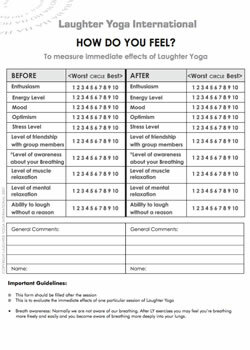 Here are several of its videos from the 2010 All America Laughter Yoga Conference DVD Pack, including Dr Kagtaria’s closing keynote. This DVD pack is currently on sale for $99. DVD 9: Three Run-Through Laughter Yoga Sessions with S Gendry, J Briar and L Gentry: Experience the different teaching styles and approach to Laughter Yoga of America’s top 3 Master Laughter Yoga Teachers! This entry was posted in Laughter News and tagged laughter yoga, spiritual practice, women in business, work life balance, yoga conference, yoga sessions on October 9, 2011 by Sebastien Gendry. This entry was posted in Laughter News and tagged Abha Rathore, Baba Pritpal Singh, Burail Jail, convicts, deep breathing, frail heart, jail authorities, Kshatriya, laughter and clapping, laughter yoga, pritpal singh, Religion and Spirituality, Ruchika Girhotra, yoga sessions on June 27, 2010 by Sebastien Gendry. Sarah Birch and Victoria Cook are certainly having a laugh with their business, Square Peg. The pair, both in their 20s, set up the business 18 months ago after meeting on a performing arts course at Salford University. Square Peg provides comedy workshops and laughter yoga sessions. 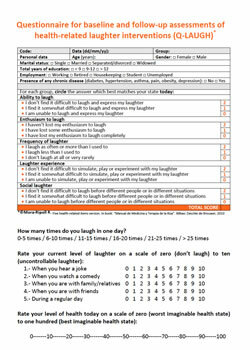 This entry was posted in Laughter News and tagged alternative education, business square, comedy scene, education centre, having a laugh, laughter yoga, negative stereotypes, sarah birch, square peg, yoga sessions on May 19, 2010 by Sebastien Gendry.